A California teen in his first year of NASCAR Late Model competition is the inaugural NASCAR Whelen All-American Series Rookie of the Year presented by Jostens. Jacob Gomes, 16, of Manteca, Calif., won three features at his home track of the new Stockton 99 Speedway, a .250-mile paved oval in Stockton, Calif. He also competed at All American Speedway in Roseville, Calif., and Madera (Calif.) Speedway. Both of those tracks are .300-mile paved ovals. Gomes is the first driver to win the newly-created NASCAR Whelen All-American Series Rookie of the Year Award presented by Jostens. The rookie program was open to first-time feature division NASCAR license holders. The best 18 finishes counted toward the rookie competition. Gomes’ combined 18-race record at all three tracks was three wins, 14 top fives and 18 top tens. 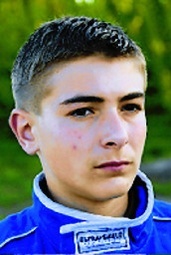 Although just a Junior at East Union High School in Manteca, Gomes has been racing half of his life. Originally interested in racing from going to tracks and watching his father, Paul, work as a crew chief and mechanic on race cars, Gomes first raced in “Box Stocks,” a go-cart type division at age eight. Starting at age 10, he moved up to Mini Cup cars, before advancing to Baby Grands – full-fledged race cars – at age 14. He won plenty of races and championships along the way. Gomes’ Chevy Monte Carlo is owned by Ron and Susan Dell’Osso and his parents, Paul and Jennifer. Gomes’ brother Joshua, 14, is now racing in Baby Grands while sister Danica, 10, is into baseball. “With two sons racing and daughter playing baseball, there’s not much time or sleep,” Paul Gomes said. The crew chief duties are shared by Ty Joiner and Billy Shaul. Joiner has won two NASCAR Camping Series West championships with driver Eric Holmes. Crew members include Paul Gomes, Josh Gomes, Chris Owen, Larry Lawrence, Tim Hendricks, Dan Hendricks, Daniel Coe, Chris Oliveira and Brandon Steadman. Sponsors of the Rex Hutchinson Race Engines powered Race Car Factory chassis car include Dell’Osso Family Farms/www.pumpkinmaze.com, Joiner Motorsports, George Perry & Sons Inc., Land & Sea Organics, Todd Garibaldi Insurance Agency Inc., Crop Production Services, River Islands at Lathrop, N.E.B. Transportation, Casa Mendoza, 4B Farms, Wrapped Graphics, Cubiburu Livestock, Mid-Cal Tractor, Weisner & Cerato Machine Shop, Siemering Farms, David’s Racing Products, TYPP/Mary Kennedy-Bracken, Roger Morris - Two Rock Media, Inc., and Gomes Motorsports. The Gomes family is partners in George Perry & Sons that operates a 7,000 acre agricultural farm. The farm is one of the largest producers of watermelons and pumpkins in the nation. Stepping up to Late Models was problematic for young Gomes in the spring, but he worked through it. The family racing linage goes back to a cousin, Dave Byrd who went to watch his uncle, Johnny Brazil, race in the 1960s. Byrd is an accomplished driver on both dirt and asphalt. He won the 1983 NASCAR Whelen All-American Series Pacific Coast Region championship. Byrd has a total of nine NASCAR California track championships, including Stockton in 1994. Byrd continues to race, and competed in Late Models twice with Gomes in 2009. The family competition was a draw. Each finished ahead of the other in one of the events. Gomes has already set a goal to enter some NASCAR Camping World Series West events in 2010. “I’m trying to make my way through NASCAR-sanctioned divisions and try to work my way up,” Gomes said.